Paris, Pittsburgh, And More: Rain, Rain Go Away! It was a state of emergency in Paris (again) this week, but this time, the brutish side of Mother Nature came calling. A month’s worth of rain dumped on the city, swelling the Seine. Someone was rolling dice over our heads. How would they land? Snake eyes? The weather moved in with bolts of lightning a week ago, badly injuring a group of children and adults at a birthday party in Parc Monceau in the 8th arrondissement, where I regularly go to eat my bagged lunch. And then the rain just didn’t stop falling on our plain. 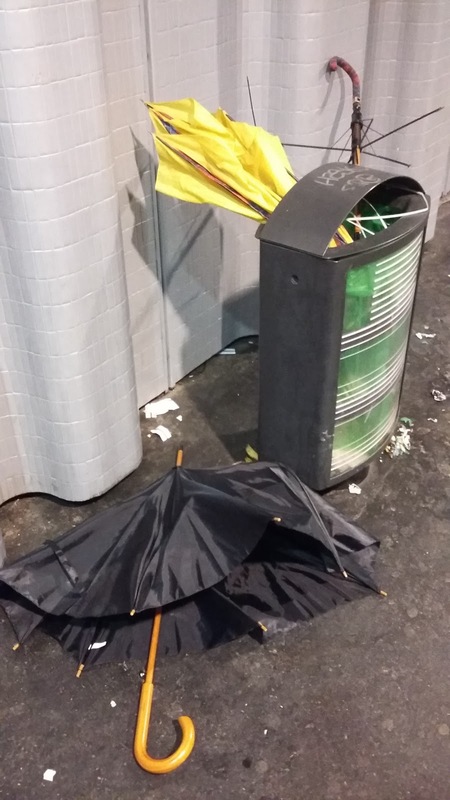 Nevertheless, Parisians kept on keeping on, even as umbrellas gave up their ghosts, and despite transportation strikes that cut back on train service. 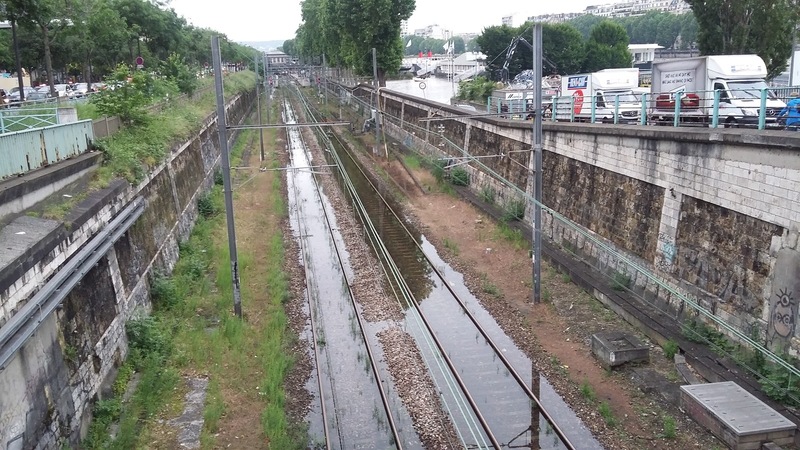 But water trumped even the forces of France’s ardent unionists, and by Thursday, flooded out my train to Paris, the RER C commuter line that moves 500,000 people each day. To avoid the crowds on the bus and Métro lines, I pedaled into work—about 9 kilometers or 6 miles. The mayor warned residents in my building to move their cars out of the underground garage onto the street, because at any time, the authorities could bolt the anti-flood doors. A friend of mine who lives on a houseboat upriver, “Captain” Bob, was up to his waist-high waders in water, batting down the hatches. He was safe and sound, but exhausted. Not only from bailing himself out, but his neighbors as well. Bob moved into his boat in the fall of 1982, missing the last big flood by a few months. “I’ve experienced flooding, but not this much,” he said, noting that the Seine was only 5 centimeters away from beating the 34-year high. One thing you can’t beat, he says, is the “real spirit of camaraderie. Everybody’s helping each other out.” The biggest problem is reaching shore. 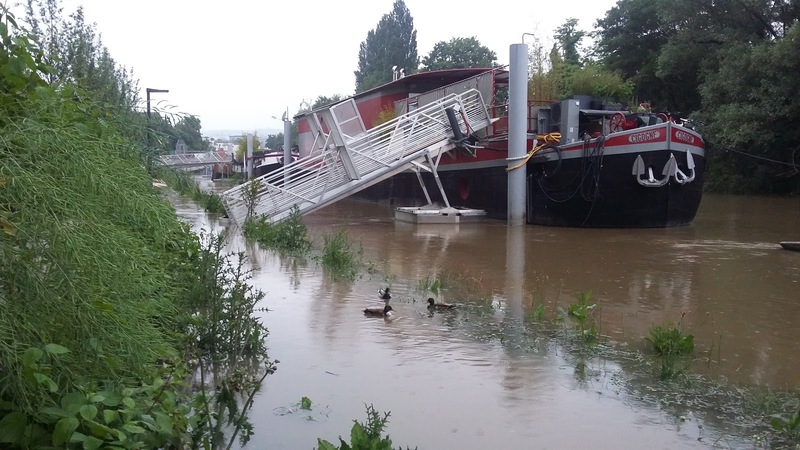 A Parisian houseboat isn’t meant to move, but remains moored in a fixed location as flood waters rise around it. What’s impressive this year, he said, is that French bureaucracy moved at record speed to help the houseboaters. A few days ago, a municipal truck made the rounds, delivering 6-meter long planks to residents, so they could extend their gangplanks to reach shore. For years, Bob said, his boat association has been talking about preparing for the 100-year flood, but nobody has taken that seriously. Actually, that's not entirely true. In March, Paris staged an exercise to test the government's response to a centennial flood, illustrating the devastating effects with this video. But more should be done, according to this OECD report on risk management for the Seine. The waters are receding today. The banks have held, and dryer heads have prevailed. However, the threat of the Big One still lies ahead, looming ever larger as we mess with Mother Nature, tempting our fate.